Modern technology has made teleworking easier than ever before. How to adapt management practices to capitalize fully on these opportunities while preserving the quality of teamwork? Companies are investing massively in infrastructure designed to enable employees to work in geographically dispersed locations. In 2008 alone, over $35 billion were devoted to the installation of collaborative software and platforms. These investments are intended to accelerate and reduce the cost of teleworker interactions. Yet, experience shows that information technology can only go so far in improving the effectiveness of geographically dispersed teams. While advanced communication tools clearly facilitate the transmission of information, teleworkers must still find a way to develop real team momentum. Experience shows this can be trickier than it seems. Indeed, for telecommuting to work, teleworkers and their managers must not only effectively share information, but also completely rethink their work practices. 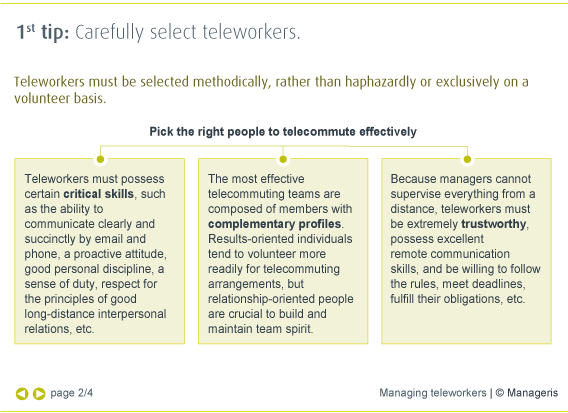 – Select teleworkers carefully. Companies are advised to apply a serious process to recruit telecommuting candidates, rather than simply ask for volunteers. – Help teleworkers get organized. 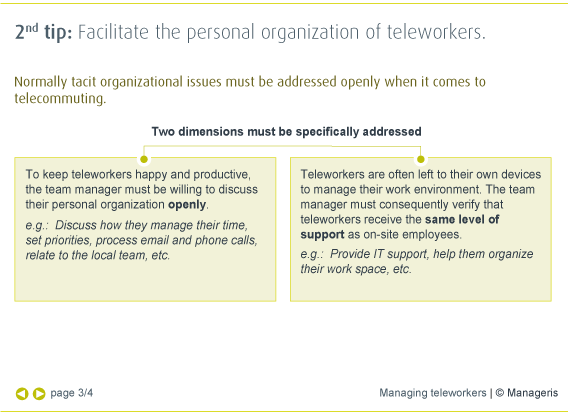 Managers are advised to discuss with teleworkers the requisite personal discipline as well as the material resources needed to establish effective telecommuting arrangements. – Adapt your management reflexes. 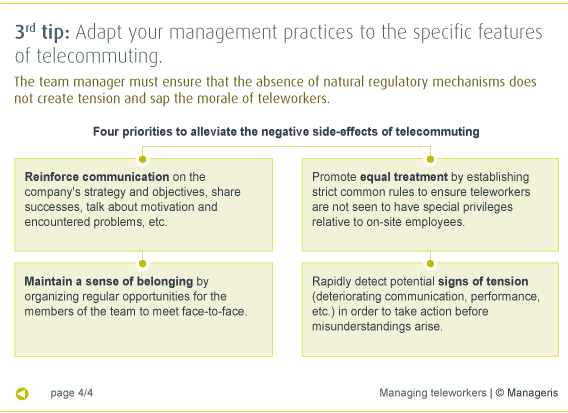 To manage teleworkers effectively, companies must actively compensate for the absence of the natural regulatory mechanisms that exist when people work together in the same physical location. The success factors in managing geographically dispersed teams. How to mature as a manager in new work environments marked by the omnipresence of communication tools? How to adjust to managing a geographically dispersed team? Several INSEAD experts take stock of the practices of virtual management.